This new board allows you to reduce your display voltage in order to prolong the life of your pinball displays. Better yet, it allows you to reduce the display voltage in ~1 volt increments! Re-rating the zener diodes on the power board results in a ~10 volt power drop, which may not work if your displays are a bit on the weaker side. This board provides the flexibility in allowing you to choose the exact level of power that works best with your displays. This board also requires NO SOLDERING. Your original boards remain untouched . The reduction in voltage means your displays don't burn as hot, which extends their life. As your displays continue to age, their brightness will diminish over time. In this case, you can simply move a jumper and increase the display voltage slightly to compensate. Your displays are solid, yet still protected. The soldering iron stays in the toolbox. Additionally, the display driver hardware uses chips that are being run at their design maximum. These chips are getting harder to find every day, and the price is only going up. Reducing the voltage to the displays will also help protect these hard to find chips. As a bonus, this board also adds two fuses to help protect your high-voltage power supply. If a display tube or chip goes bad and shorts the high voltages together, it will do a lot of damage to your HV power supply (and possibly other hardware). Towards the end of the System 11A era (starting with Fire! ), Williams added external 1/4 amp, slo-blo fuses to the +100 and -100 power lines. The next few games re-rated these fuses down to 1/10th amp, slo-blo fuses. 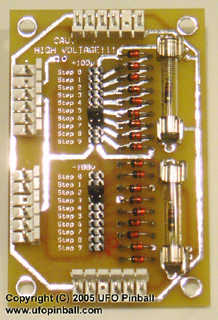 When the power supply board was redesigned (starting with Taxi), Williams moved these fuses onto the Power Supply board, and increased the rating to 1/8th amp, slo-blo fuses. The "Display Saver" board will come with 1/8th amp fuses installed. If you decide you would like to re-rate your board down to 1/10th amp fuses, you can get those from Great Plains Electronics. The "Display Saver" board should be compatible with any Williams power supply from System 3 through System 11C. The board should also be compatible with any Data East game that used Alpha-Numeric displays. Different power supplies over the years changed the order of the wires on the 6-pin connector, so you should check your game to be sure you order the correct wiring harness. Unfortunately, this board does not work with the alpha-numeric series WPC games Funhouse, Bride of Pinbot or Harley Davidson. Again, this board will work on any Williams game prior to the WPC line, or any Data East game that uses alpha-numeric displays. I have not looked into working with dot matrix games (yet!) This kit is also not compatible with PinLED ... though I somehow doubt you'd need it there. I should note here that Clay's guides are indeed very useful, and contain some important information. If your displays are already flaky, this board will not fix your displays. You probably need to either rebuild your power supply (GPE or Pinliz), or replace your display tubes (PinballPCB), or both. If you do not see your game listed here, please send E-Mail. There are a number of other games that use the same hardware as the above games and are probably supported.